How to Sear Meat. Searing meat is all about building tons of great flavor! Searing food causes the browning and caramelization that creates layers of flavors, known as the Maillard Reaction. It’s where science and technique create amazing meals. Maillard Reaction: A concurrent chemical reaction in which heat transforms proteins and sugars on and in food. Creating new aromas, colors, and flavors. It makes a grilled steak taste charred, pan-fried chicken taste crunchy and moist, and pan-roasted almonds taste toasty. Temperatures must be high! Fast heating causes moisture to evaporate and browning starts to occur. Rapid heating via grills, hot pans, ovens, griddles, blowtorches (after sous viding) and deep fryers all create deep layered flavors in food. When meat hits a fiery hot surface, the outside rapidly begins to brown and caramelize. Steaks, burgers, stew, roasts, braises and a host of other foods benefit from this important step. Searing your meat gives full on flavor! 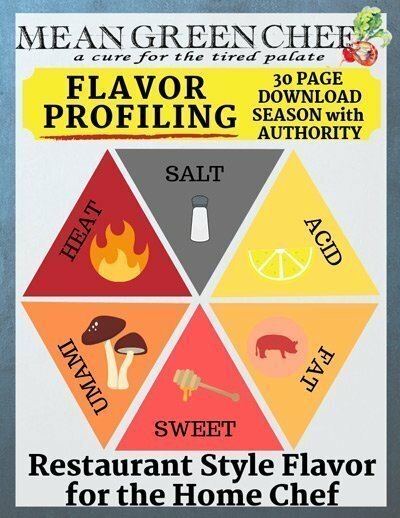 While it may take a few fast more minutes, this step is crucial in flavor development. A beautifully crusted grilled steak will be chosen every time, over an incorrectly cooked grey cut of meat. Searing does not lock in the juices on a cut of meat. 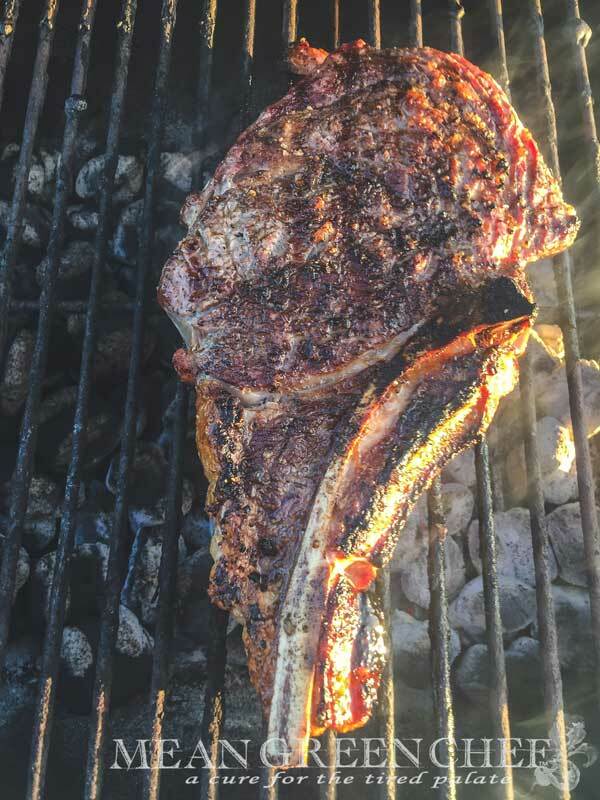 Searing develops a crust that has a deep and intensified character that is triggered by the Maillard Reaction. Pick the right pan: Since high temperatures are needed to sear meat and achieve a deep brown color. Choose a stout pan; cast iron is ideal. However, a heavy-duty stainless steel pan will work perfectly too! If you don’t have a good frying pan, invest in one. Old cast iron can often be found in local thrift stores and if you prefer stainless look for try-ply bonded silver such as this one, which is what we use. Stay away from nonstick and thin bottomed aluminum pans. Prepare the meat: Allow meat to come to room temperature, depending on the cut and size time will vary. A steak will take about 30 minutes while a roast can take an hour or a little more. We do not recommend allowing meat to sit out for more than 2 hours at room temperature. If you are making a stew, cut pieces uniformly, tie up roasts with twine, etc. Pat off excess moisture and season with kosher sea salt. Heat the pan: Heat the pan over medium-high heat or flame, every stove and pan will be slightly different. Once you have seared off a few ingredients, you’ll find the sweet spot temperature wise. Add the oil: Once your pan is hot, then add the oil. As stated before typically you’ll use a neutral oil such as vegetable or canola, due to their high smoke point. After adding the oil to the already hot pan, watch for the oil to shimmer and ripple in the pan. Add the meat to the pan: Carefully place the meat in the pan. Being sure not to over-crowd the pieces, which will create steam and prohibit browning. Leave at least an inch of room between cuts of meat, you may need to sear in batches. The meat will pop and sizzle as it comes in contact with the hot oil, adhering to the pan. Don’t move the meat: Don’t poke or prod the meat as it browns and caramelizes, cooking time will vary depending on the size and cut of meat. Typically anywhere from 1-10 minutes per side. A scallop, of course, will sear beautifully in about a minute per side. A large roast that will be braised after browning can take up to 10 minutes per side. Flip the meat over: As the meat becomes seared it will release from the pan and flip easily. Be sure that the meat has a dark caramelized color. Then proceed to sear the other sides. Don’t forget to sear the sides of meat as well, especially when they have a layer of fat on the outside, such as a pork chop. Add more oil as necessary and lower the heat slightly if your senses tell you the pan is too hot. Seeing or smelling smoke? Lower the heat. Deglaze the pan: After you have finished searing, transfer the meat to a clean platter. The bottom of the pan will be crusted with a sticky brown glaze, called “Fond” pronounced (fáhn), meaning the bottom or base! Pour in 1 cup of wine or broth, it will begin to boil immediately. Using a stiff wooden spatula scrape the bottom of the pan help loosen the browned bits and release flavor. In stews and braises, the deglazing liquid will be added directly to the rest of the cooking stock. For steaks, chops, chicken breasts or any other cut of meat, you can make a flavor-packed pan sauce. For a simple pan sauce: With your pan over medium-high heat or flame, add a small minced shallot and clove of garlic. As they begin to brown and release their moisture quickly add your 1/2 cup of wine (or broth). Scrape up the browned bits into the rolling wine (or broth) after the mixture has cooked down for a minute add a cup of water and deglaze the pan again until the sauce reduces by two-thirds. Check out our, Braised Brisket with Bourbon Peach Glaze and impart amazing flavor into our Roasted Chicken and Dumplings by browning the bird first! The perfect bite that melts in your mouth. An overnight dry rub imparts a subtle flavor and begins to tenderize this versatile cut. Along braise in a beer and bourbon bath in a low oven with herbs and spices and finished with a peach glaze under a hot broiler. Slice and Mmmmmm mmmm mmm!